Dang! This card is sweet. I liked the regular versions of these die-cuts from the 2012 Bowman Platinum set but the certified autos are even better. Sure it's a sticker auto but I can overlook that since its numbered 12/25 on the front. Another great addition to our Daniel Hudson collection. A coworker who sits at a cubicle near mine is moving to a new area of our building. While packing up her belongings she decided it was time to downsize some of the miscellaneous things she had acquired over the years. 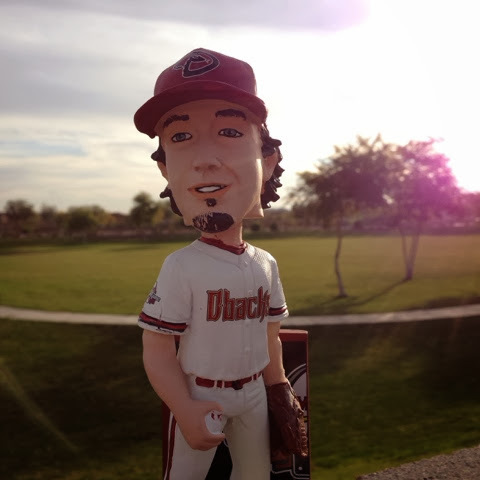 This Brandon Webb bobblehead was one of the items up for grabs. I didn't have it so I was glad to take it home. This was a stadium giveaway from 2007 and commemorates Webb winning the Cy Young award the year prior. Here's another card we picked up as part of our COMC Black Friday purchase. 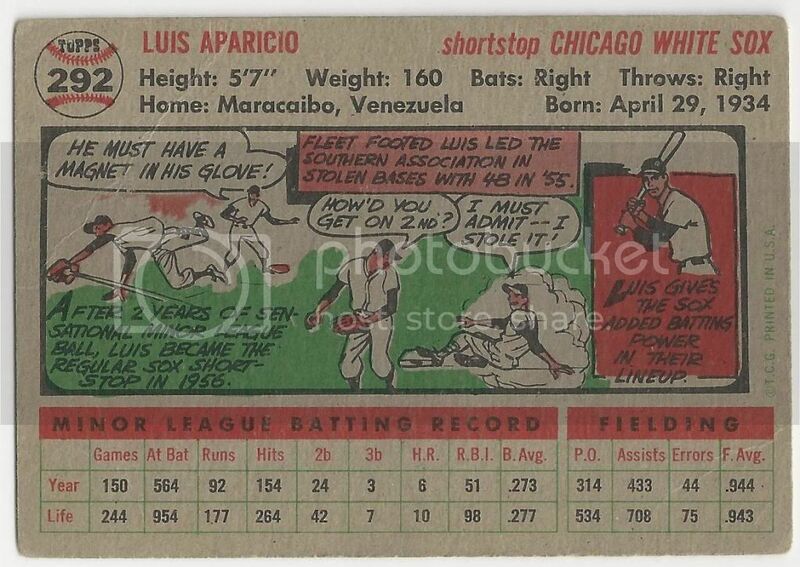 I like how this parallel of Luis Aparicio's 2007 UD Masterpieces card is described as "windsor green" not just "green." Classy. 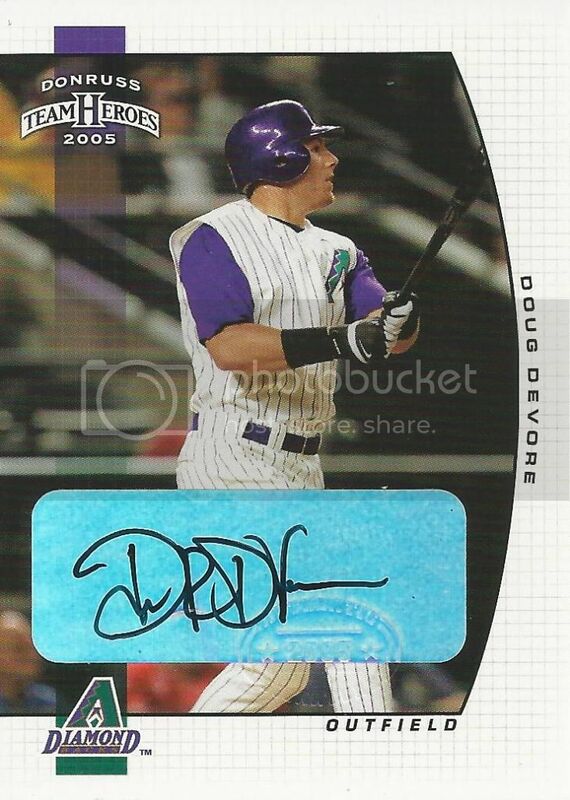 I picked up this certified autograph of Doug Devore from the 2005 Donruss Team Heroes set as part of my COMC Black Friday purchase. You've got to love these mid-00s Donruss sticker autographs. Doug's big league career didn't last long. 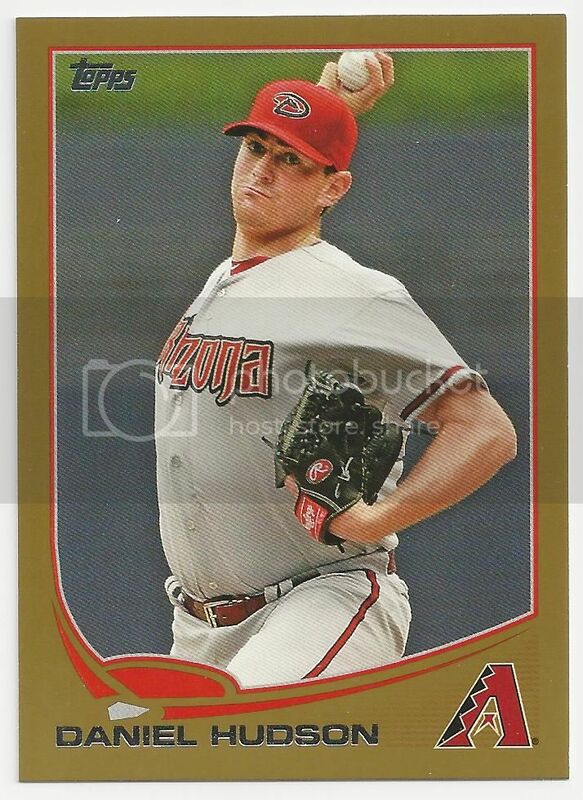 He played in 50 games for the Diamondbacks in 2004. During that time he .224 with 3 home runs and 13 RBIs. The design for the 2012 Topps Triple Threads set was great. Nice and simple with decent sized jersey swatches and an on card autograph. Almost perfect, right? I think so. I just wished they scanned better. That foilyness just doesn't come across well digitally. This is Daniel Hudson's green parallel from the set. It's numbered 30/50 on the front. This is the third version of this card in our collection. I've always liked minor league team sets. While I don't have a minor league team close by I've been able to pick up a few sets online or when traveling. 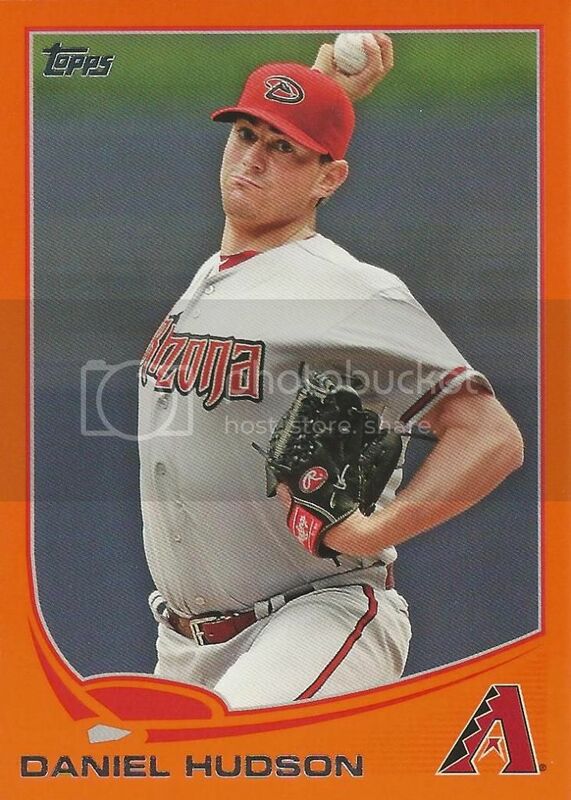 I found this Daniel Hudson card from the 2009 Kannapolis Intimidators team set for a great price. 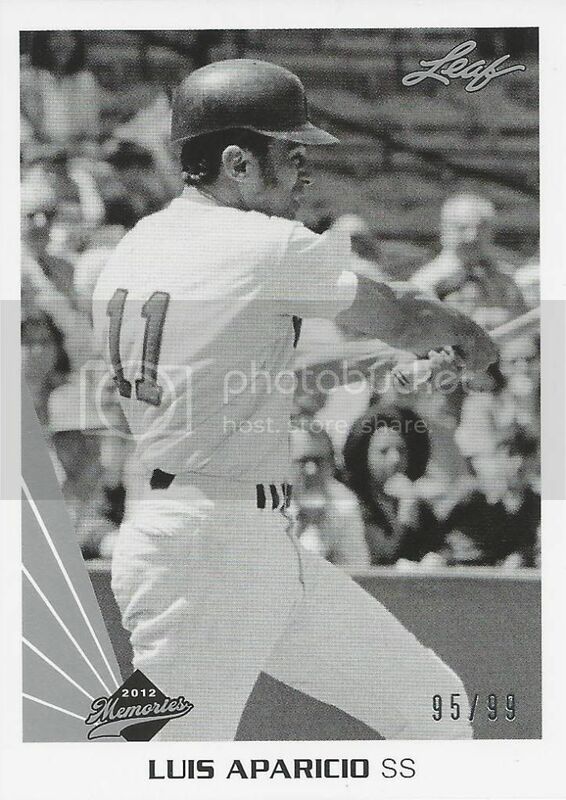 In fact the seller had a lot of three of the same card listed for a price I would have gladly paid for just one. 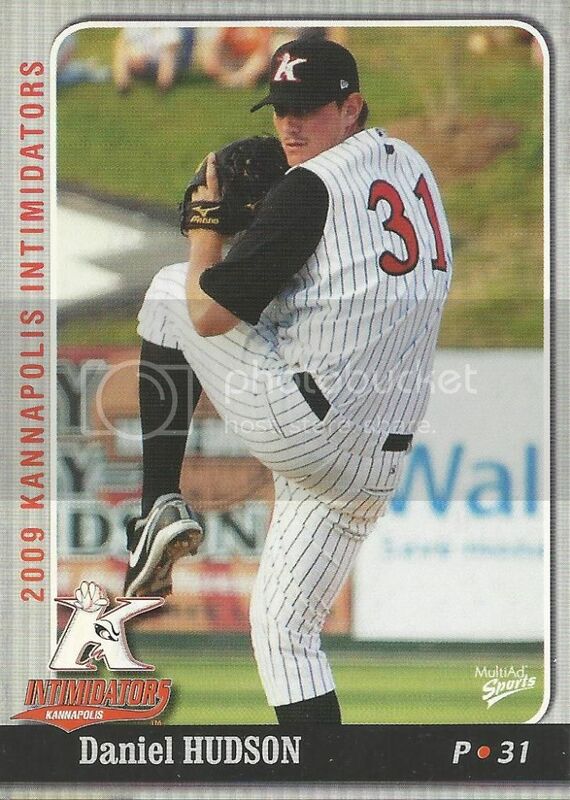 When I googled "Daniel Hudson Kannapolis Intimidators" an interesting article from Jonathan Mayo from MLB.com came up. He has a nice breakdown of Daniel's first season in pro baseball. It chronicles his journey from single a all the way to Chicago in just a few months. You can check that out here. 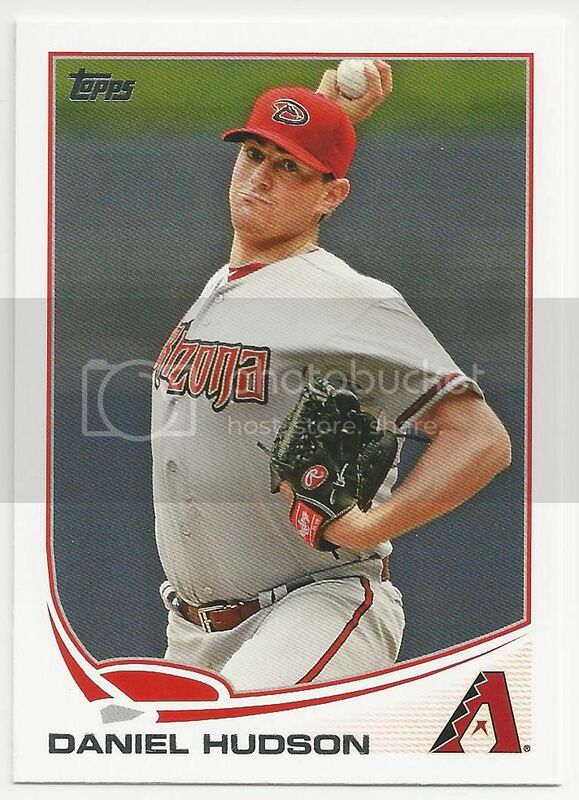 AJ from The Lost Collector sent over a few cards including this Daniel Hudson from the 2012 Topps Sticker Collection. I had seen packs of these stickers at the store before but never bought any. They're pretty cool. Thanks, AJ! Here's another nice pickup from our COMC Black Friday purchase. 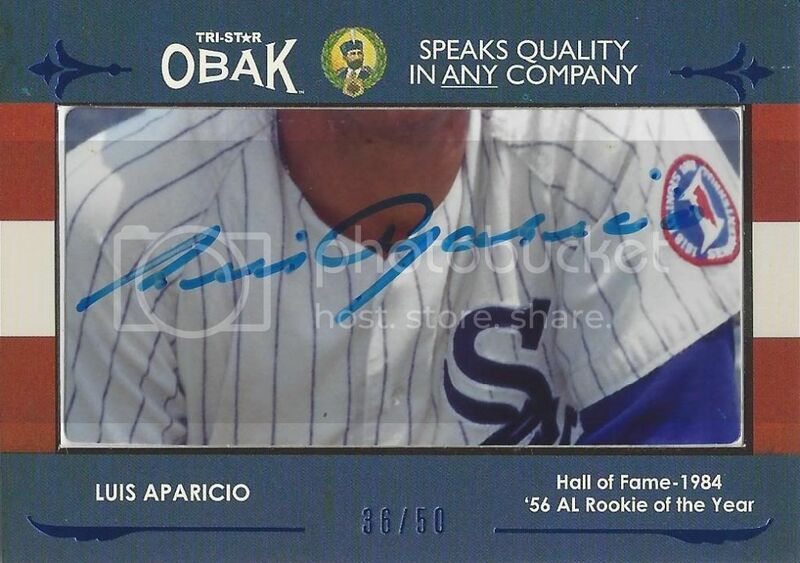 This Luis Aparicio card is from the 2012 Leaf Memories Originals set. It's numbered to 99 on the front and only set me back 91 cents. A nice deal for a nice card with a classic 90s design. Ah Turkey Red. 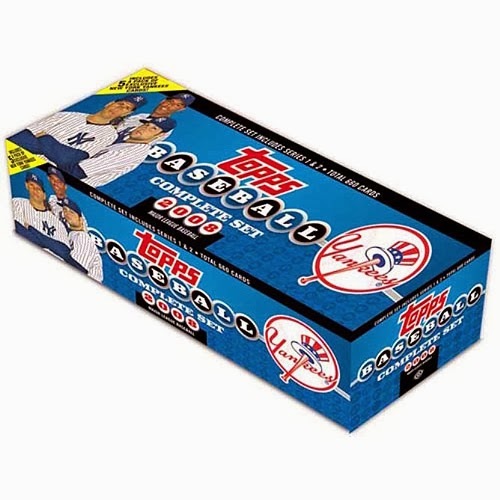 Remember how Topps crammed out down our throats until we couldn't stand you any longer? I picked up this 2006 Topps Turkey Red red parallel as part of my COMC Black Friday purchase. I prefer the base to the red border but I'm glad to have another new Lil Luis card for our collection. Spiegel from Nomo's Sushi Platter sent over a package full of awesome Diamondbacks cards. There were way to many to scan everything but here are a few of my favorites. Oh yah! 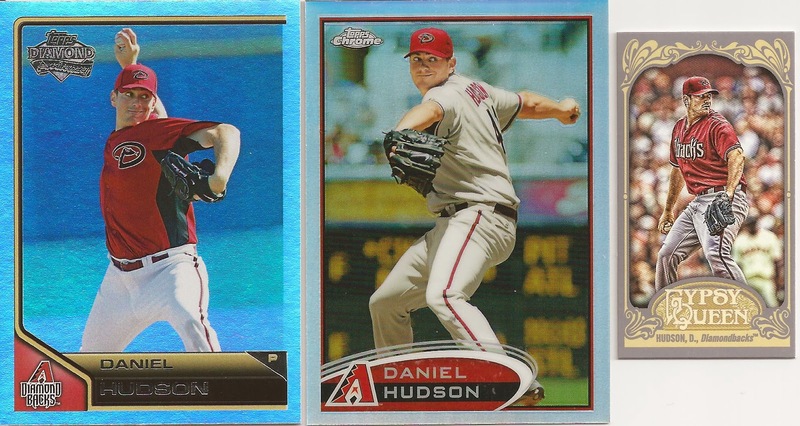 Three new Daniel Hudson cards. It's hard to tell in the scan but the Chrome is a refractor. It's out shined by the Lineage anniversary parallel. That's not just any Gypsy Queen parallell. It's a Straight Cut back. Spiegel came up with about twenty different parallels that I didn't have. Here are three of my favorites. One reason I always like getting trade packages is to see what kind of older, random D-Backs you guys have lying around. Steve Sparks! Turner Ward! Awesome! Todd Stottlemeyer's not bad either. All new to our collection. Of course anything 2008 Topps is always welcome around here too. My favorite card in the package is this Justin Upton SP from the 2012 Topps set. 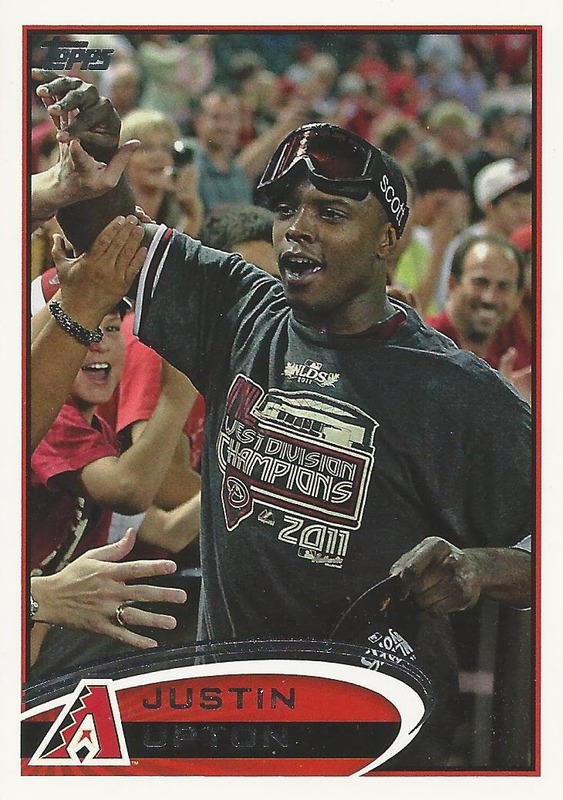 I love the picture of him celebrating with the fans after the D-Backs clinched the Western Division in 2011. 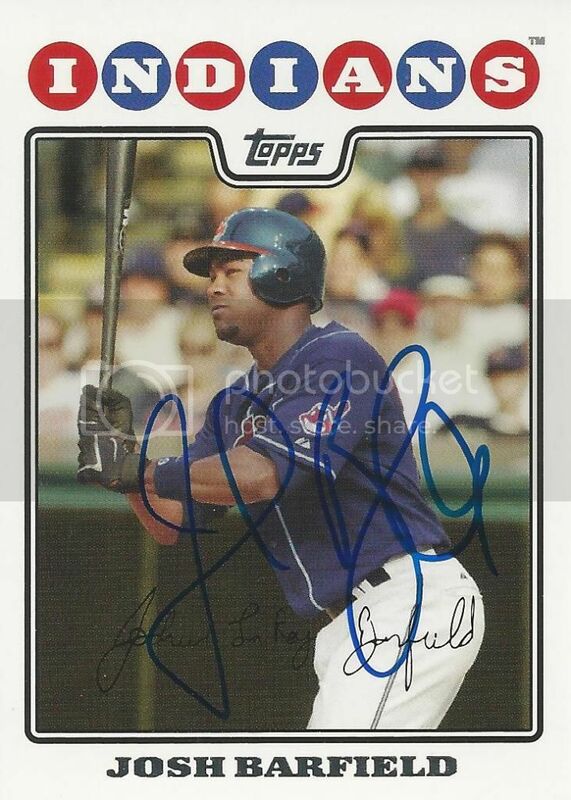 A friend from SCN helped us out last season with this signed Josh Barfield 2008 Topps card for our set. Josh signed it before a Long Island Ducks game. I remember when Josh was the Padres top prospect. He last appeared in the big leagues with the Indians in 2009. Since then he's bounced around with a few organizations and has played in the Atlantic League. I picked up this certified autograph of Andy Green from the 2005 Leaf Autographs set as part of my COMC Black Friday purchase. 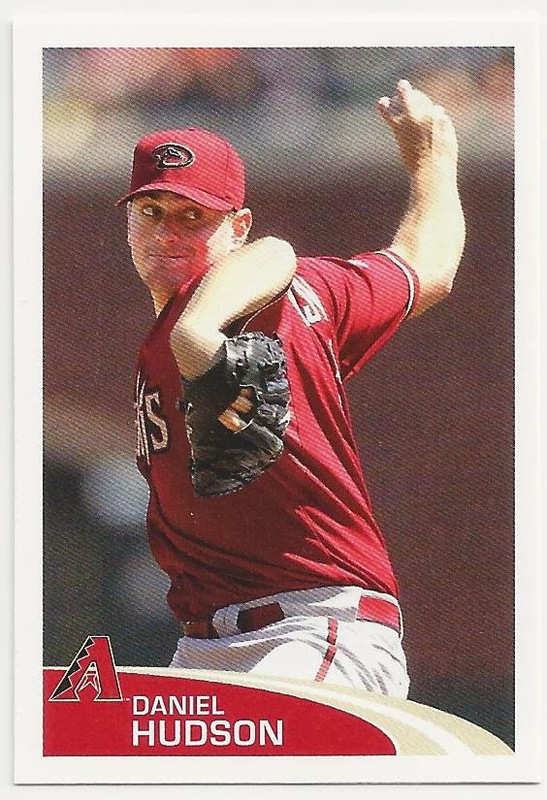 After putting up some big numbers in AAA, Andy was called up to the Diamondbacks in 2004. He got 109 at bats in 46 games but never really got going. 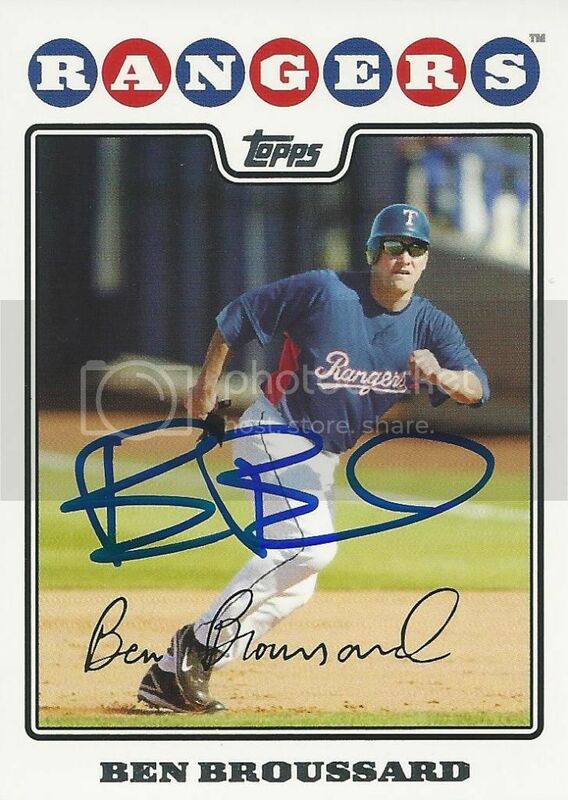 He found himself back in the minors for most of 2005 and won the Pacific Coast League's MVP award. Unfortunately he didn't do much at the big league level. Andy is currently the manager of the D-Backs Double A team, the Mobile BayBears. 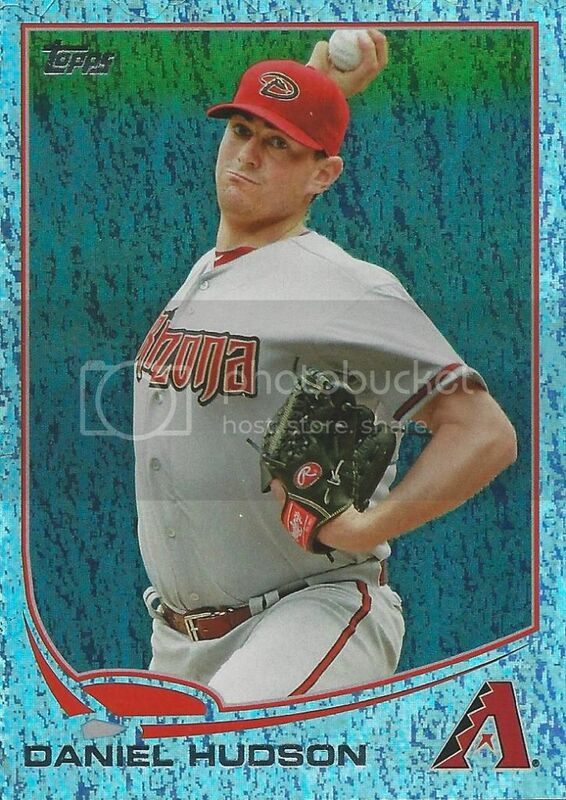 Ah another 2013 Topps Daniel Hudson card. This one is the pink border parallel from the mini set. Nice and pink and numbered 03/25 on the back. It's hard not to like anything that's numbered to 25 or less. I realized recently that I've got a ton of Daniel Hudson stuff to post. 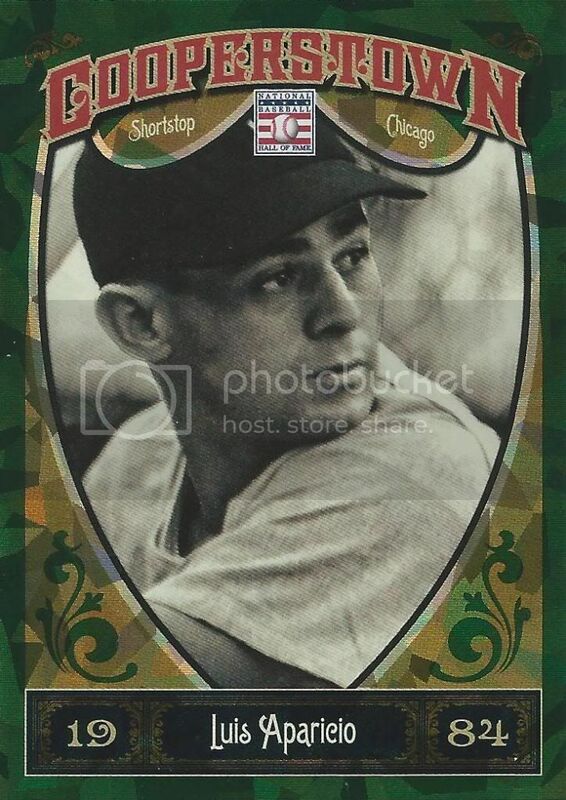 Somehow I missed this 2013 Topps mini card. It looks just like his regular card but it's smaller! OMG! Sorry... omg! When I was doing my Black Friday shopping on COMC this was a must add. 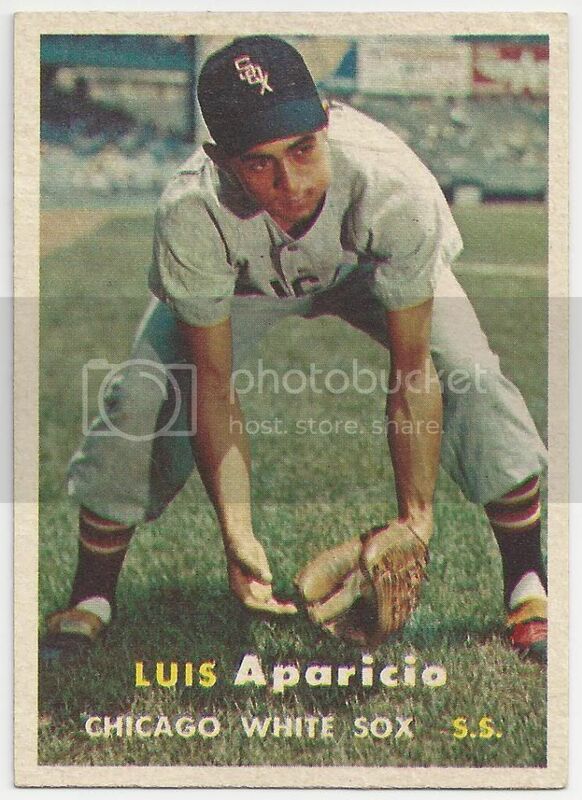 For only $1 I took home this 1960 Topps World Series Highlights card of Luis Aparicio. It came with the warning that it was in poor to fair condition. Well that was no secret because you could see plenty of creasing and damaged corners in the scan. Sometimes a perfect card is great but this one has lots of character and I love it. That was the best dollar I've spent in a long time. Each year I always look forward to the new Topps Heritage set. In addition to the classic designs used for the base set they have great inserts. 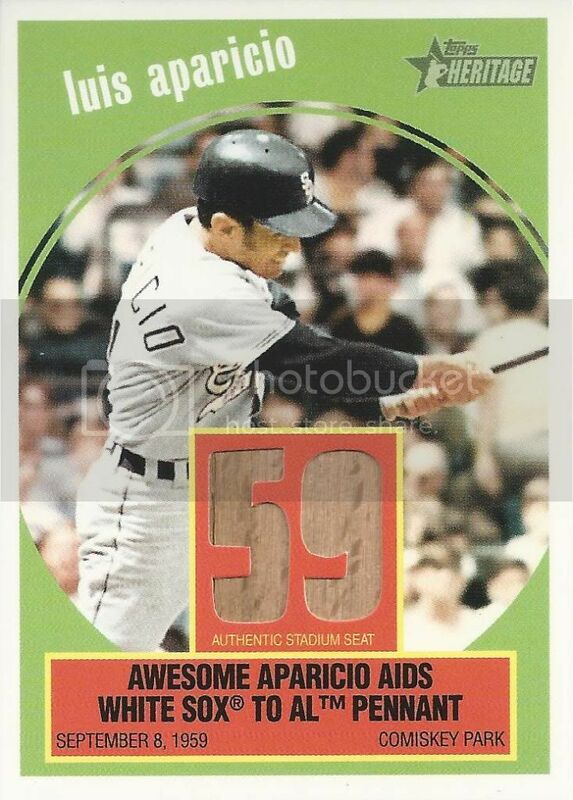 This Luis Aparicio Stadium Seat relic card from the 2008 Topps Heritage set is no exception. The best part is it commemorates Luis and the White Sox winning the AL pennant in 1959. I picked this one up as part of my COMC Black Friday purchase for just under $4. It was one of the more expensive cards I bought that day but it's been on my want list since it was originally released. I had a great idea this morning. I was going to go to the swap meet. After seeing other bloggers find cool stuff at their local thrift stores and flea markets I wanted to give it a shot too. I hadn't been to a swap meet in many years and didn't know what to expect. There were tons of people selling new hats, beauty products, and cell phone accessories. I was also surprised to find several dealers selling only underwear. New items I think. I only found one booth that had something that interested me. One guy had a table with some newer Star Wars action figures, an unopened 1994 Chad Curtis Kenner Starting Lineup figure, and a Dan Haren bobblehead. 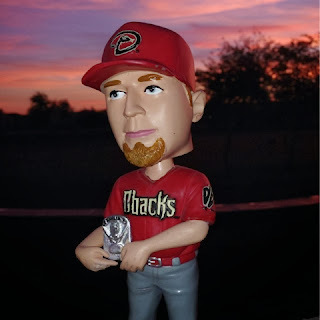 After a tough negotiation I brought home the 2009 D-Backs stadium giveaway for $5. I first remember hearing of Neal Cotts when he was a prospect for the Oakland A's. After he made the big leagues with the White Sox, he spent a few years in their bullpen. He was part of the 2005 team when the Sox won the World Series. Before the 2007 season he was traded to the Cubs and never really had much success. Some injuries set him back for the next few years. After not pitching in a big league game for nearly four years he returned to the mound for the Rangers last season. He did pretty well and ended up pitching in 58 games for Texas. 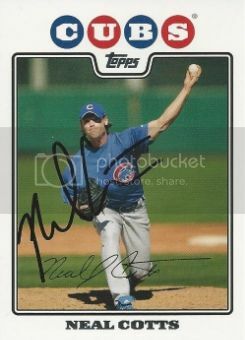 Neal signed his card from the 2008 Topps Chicago Cubs 55 card team gift set for us via from a mail request last season. 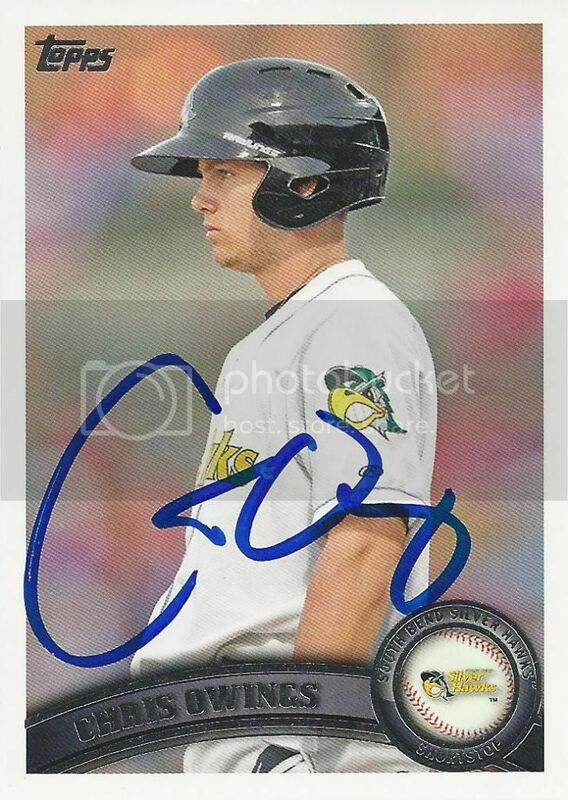 I wasn't able to get an autograph from Diamondbacks prospect Chris Owings last year during Spring Training so I sent him a request in the mail. 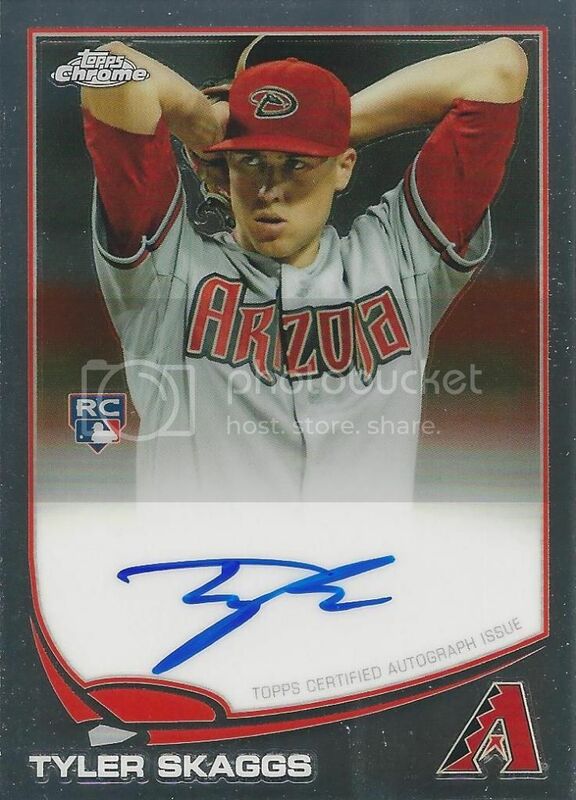 After the season ended, my 2011 Topps Pro Debut card came back signed in blue Sharpie. After posting some decent numbers during his cup of coffee at the end of last season, Chris will enter Spring Training this year in a battle with Didi Gregorius for playing time at shortstop. Whoa! 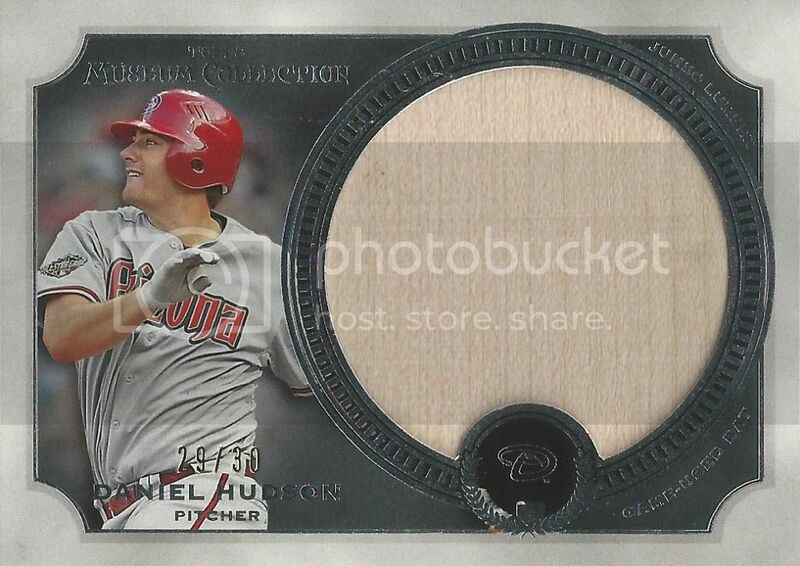 I had been hunting this Daniel Hudson bat card from the 2013 Topps Museum Collection for awhile. I finally pulled the trigger and landed this one numbered to 30. There's a few different numbering sequences with this set but they all basically look identical. It's the first jumbo relic of any type that I have in my collection. I like that Topps chose to use a picture of Daniel hitting for this bat card. Even though his left arm and bat are completely cropped at least you can see the 2011 All-Star game patch on his right sleeve. 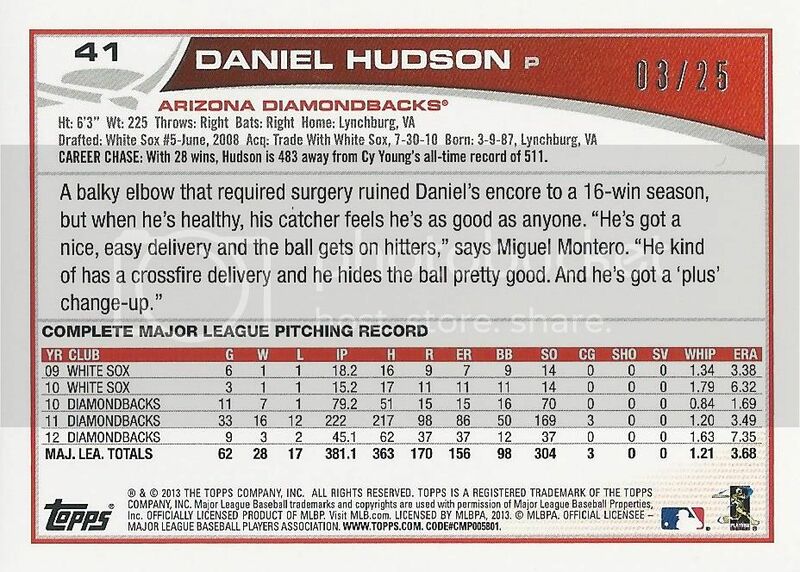 This easily becomes one of the coolest Daniel Hudson cards we have. 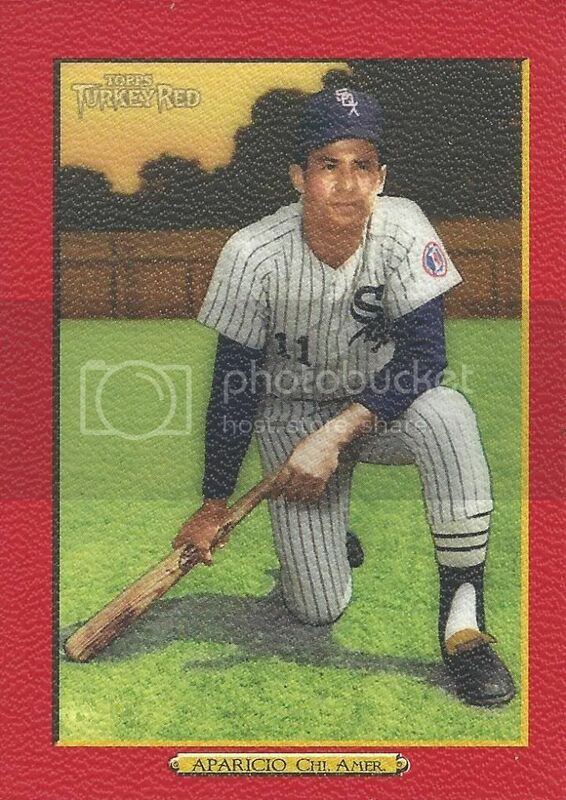 I'm trying to fill in some of the missing vintage Luis Aparicio cards we need. I saw this 1957 Topps card and had to have it. It has great centering, great corners and no creases. I don't mind a little damage but this one looked so great I knew it was coming home with me. 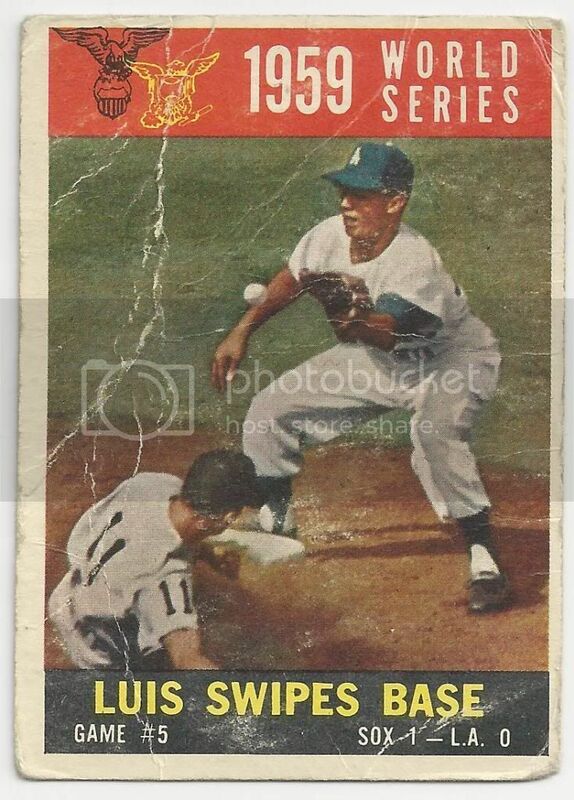 Fresh off the Rookie of the Year award, Luis led the league in stolen bases in 1957 for the second time in as many years. I found this one on eBay before the holidays. I'm not much for cut signatures but I feel like I got a pretty good deal. The seller had it listed at a reasonable price with the best offer option. I threw in a modest offer of $6 shipped and he accepted. That's a great price for a HOF auto even if it's a cut. 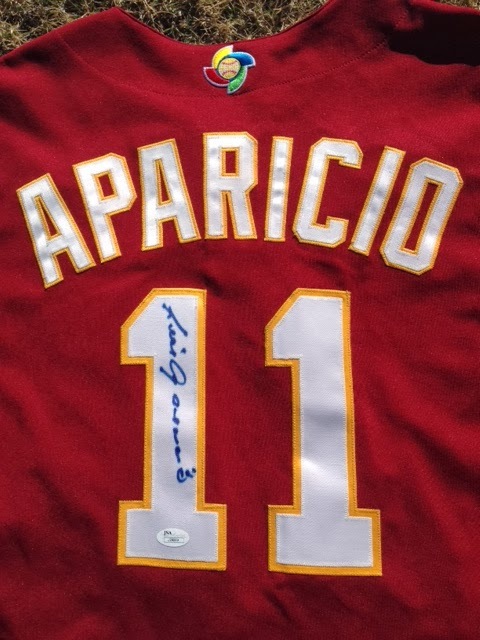 When I stumbled across an auction for this Luis Aparicio 2006 World Baseball Classic signed jersey I knew I had to have it. 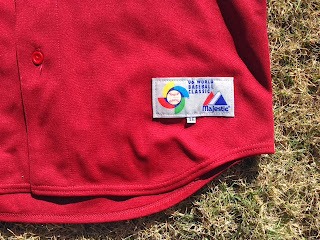 I'm not sure what the history of this jersey is exactly. 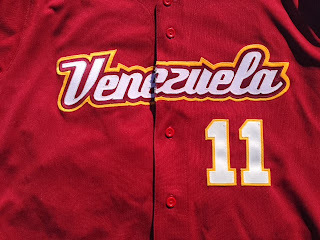 It might be something that was sold in team shops during the 06 WBC. I'm not sure why they would have one for Luis unless it was sold in Venezuela. 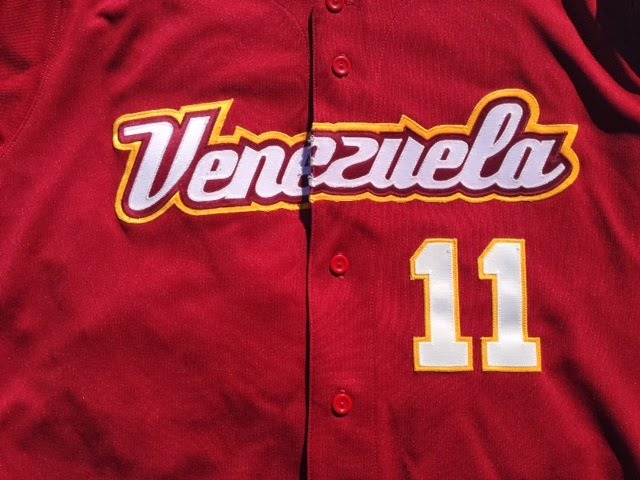 The patches on the sleeves and tags look identical to this Victor Zambrano game used jersey that was sold back in 2007 by Lelands. 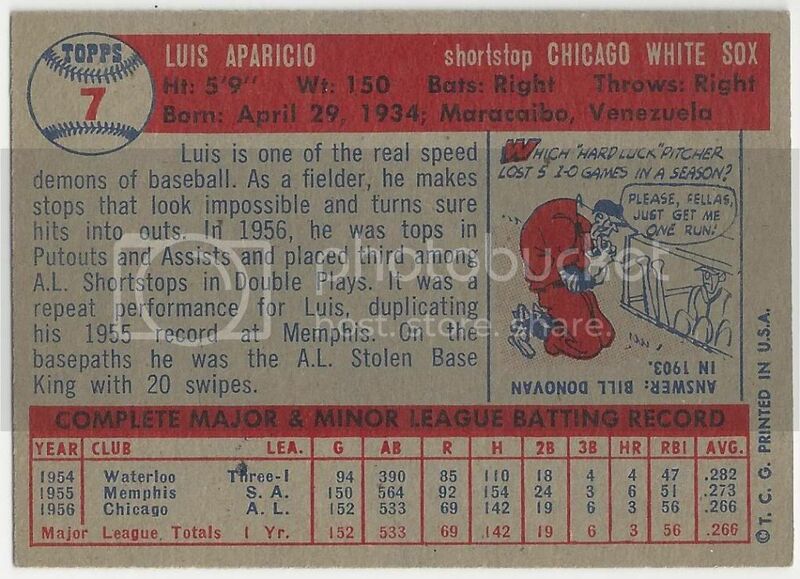 While I'll probably never know the full history, I'll just enjoy it as a unique item for our Luis Aparicio collection. I'd like to get it framed and hang it up sometime soon. We'll see I can get my wife to agree with that. I probably overpaid for this 2013 Topps Blue Sapphire Parallel of Daniel Hudson. After a few weeks only one other had popped up on eBay. I missed the first so I felt more pressure to get this one. Being numbered to 25 isn't super scarce but I didn't want to miss out. 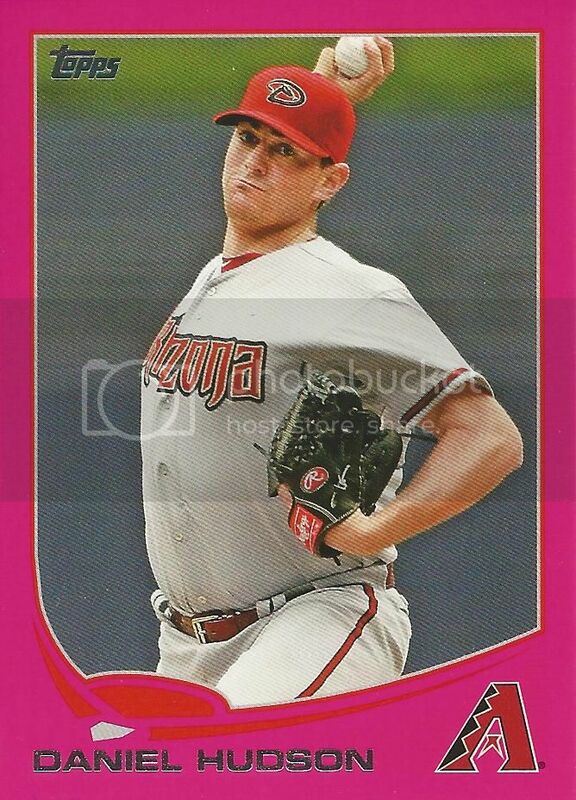 This whole rainbow thing Topps is doing with parallels was kind of fun at first but they keep cranking these things out. Isn't this like the third blueish sparkle parallel we got this year. It's a nice card but the concept is getting a little old. You may have noticed I posted a few housekeeping posts this morning. You can now find all of the cards I've posted for our player collections in two handy posts. 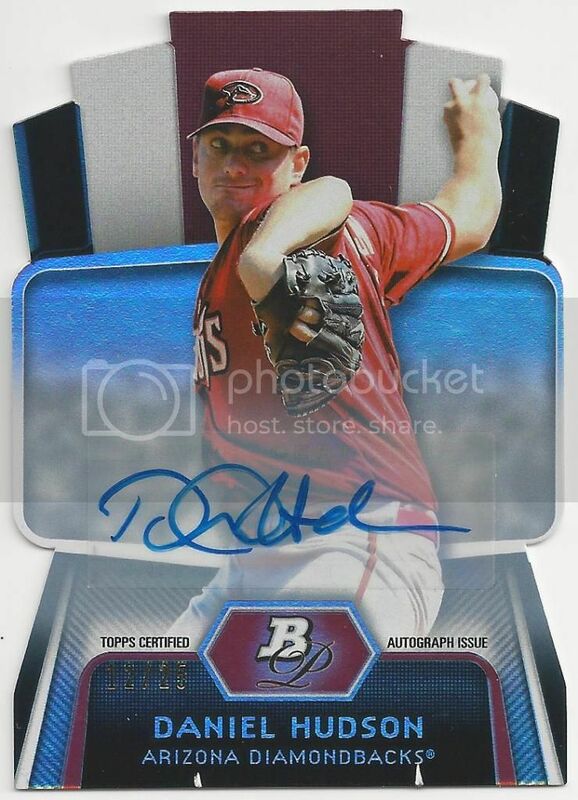 I've also simplified and updated our Diamondbacks autograph collection post. All three can be over in the right hand column for easy access. I have big plans for 2014. I have a ton of cards scanned and ready to post. Hopefully this will lead to a record year here at My 2008 Topps Set Blog. 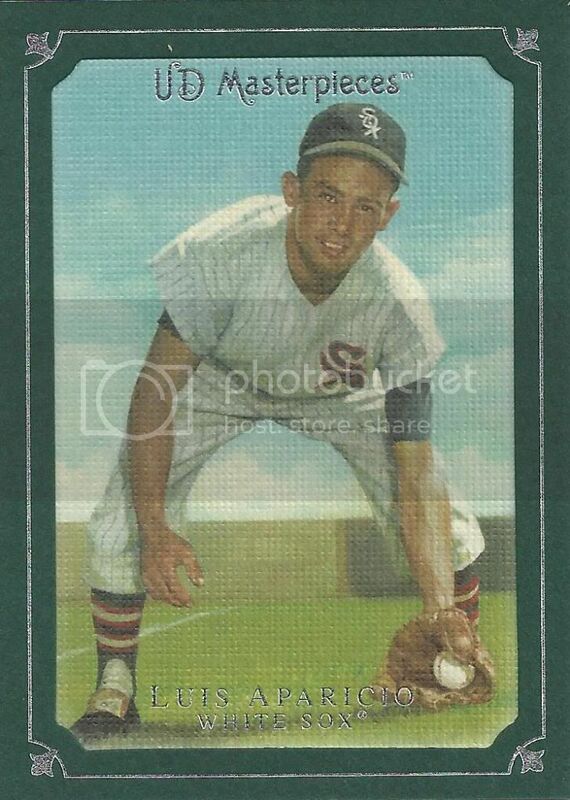 Expect some vintage Luis Aparicio, tons of Daniel Hudson parallels, lots of D-Backs and of course some new autographs for our 2008 Topps set. I've saved up some really great stuff for January that you won't want to miss. Also, I'm trying to consolidate my overall baseball card collection. It's time to get rid of some of that junk wax I've been holding onto since I was a kid. In doing so I've been working on putting together some packages. If I've sent you something in the past there's a good chance you've got some cards coming your way soon. Don't worry you won't be getting a bubble envelope full of just 1990 Topps. 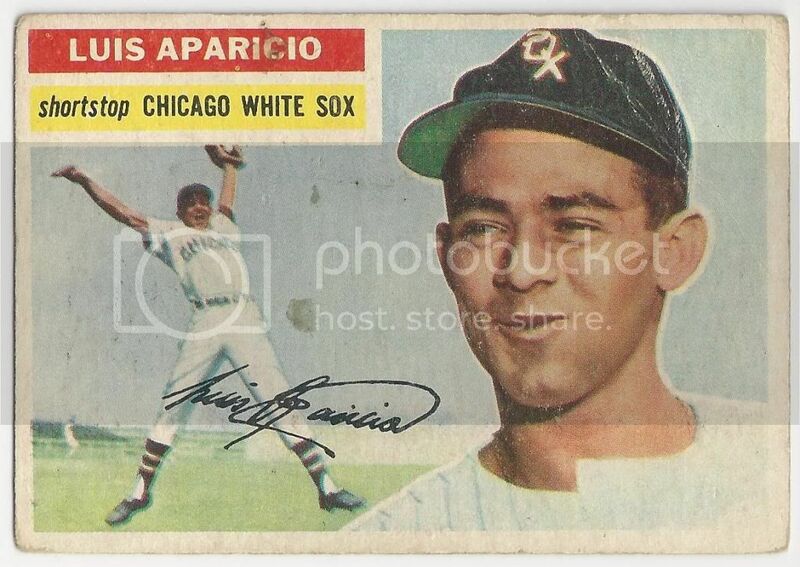 Want to check out my Luis Aparicio collection? I currently have 112 different cards.